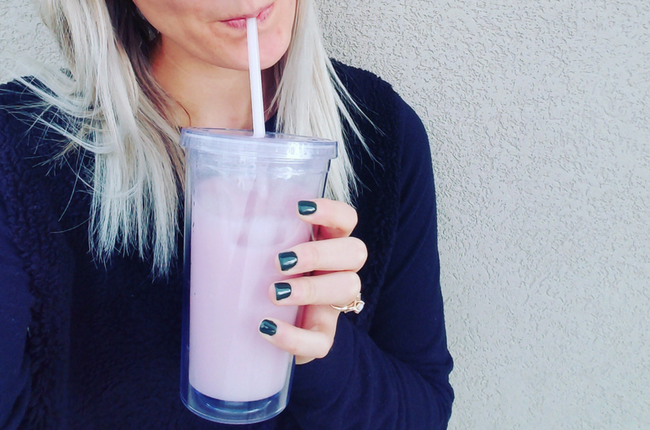 If you are unfamiliar with this unicorn-like drink, it’s an iced herbal passion tango tea with coconut milk and stevia. It’s super yummy, refreshing, fairly healthy, and one of the few things I will EVER spend money at Starbucks on. But that’s the thing, it costs money. And although it’s not the most expensive thing you can buy at Starbucks, if you crave it often (which is for me every week) the money adds up quick. I don’t know about you, but I like to save money as much as I can, especially when it’s on luxuries like drinks at Starbucks. I’ve attempted to make my own pink drink before, but I had a hard time finding the right brand and flavor of herbal tea at my grocery store. That is until my friend at work found the perfect (if not identical) flavor at Wal-Mart and we tested it out with our own coconut milk and stevia! After a few tries, I’ve finally come up with the perfect ratio of ingredients so you can enjoy the pink drink at home any time you want and save money while you’re at it! This DIY version also has less sugar as Starbucks coconut milk has quite a bit of added sugar. Click below to download a PDF of the recipe so you can keep it with you on your phone or tablet! I also include how I order the original at Starbucks when I’m feeling fancy. All I ask is you give my Facebook page a like in return. Thanks for the support! Can you use almond milk instead?